Sylvia Czarnecki – Motionclick: “A mistake is just information …” R+ horse training. 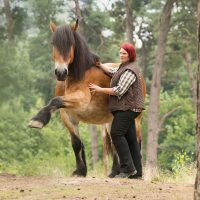 Sylvia is a professional positive reinforcement-based Horse Trainer from Germany, working closely with both horses and their trainers via her business Motionclick, since 2011. 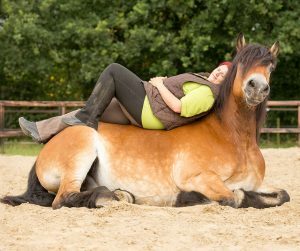 She has written two books the first being specifically about trick behavior training and the second all about using positive reinforcement with equines. Sylvia delivers clinics, lectures, and lessons on force-free horse training, psychology, and learning theory. She also runs an online membership program for people who want to dive deeper into these subjects. Sylvia is a certified member of the International Association of Animal Behavior Consultants (IAABC) and the Pet Professional Guild (PPG). Her passion is to help horses and their owners, develop a trust-based, force-free partnership, rooted in modern and science-based learning. Following the guidelines of “Effectiveness is not enough”, Sylvia starts her programs considering the horse’s emotions and uses this to help guide and create a stress-free and non-coercive training atmosphere with the aim of creating the most positive learning experience for both – horse and human. CLICK HERE for Sylvia Czarnecki’s Motionclick website. CLICK HERE for Sylvia Czarnecki’s Motionclick Akademie (German) website. Great podcast! So much that resonated with me . Thank you Ryan for making it happen, thank you Slyvia for being there.